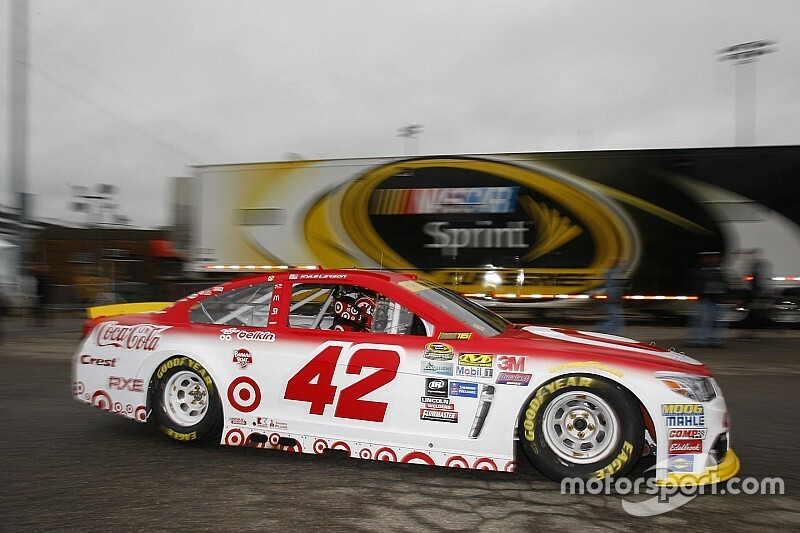 Kyle Larson continued his trend of topping the speed chart in practice. After sweeping all three sessions at New Hampshire Motor Speedway last weekend, Larson posted the top speed of 165.578mph (21.742mph) in qualifying trim on his 25th lap of the 70-minute session. Carl Edwards was second quick with a lap of 165.578mph, followed by Matt Kenseth (164.775mph), Ryan Newman (164.511mph), Jimmie Johnson (164.301mph), Chase Elliott (164.286mph), Denny Hamlin (163.845mph), Paul Menard (163.718mph), Austin Dillon (163.703mph) Martin Truex Jr. (163.584mph) and Kurt Busch (162.411mph). “Just got to get rid of that little bit of sliding the nose when I hit the gas, but not bad,” Busch said. Kyle Busch led the Best 10 Consecutive Lap Averages (159.336mph) and completed the most laps (60). Kevin Harvick (158.212mph), Austin Dillon (156.671mph) and Trevor Bayne (156.561mph) were the only other drivers to qualify in that category. Joey Logano’s Ford was 12th quick (162.948mph) in single lap runs. Fellow Chasers Jamie McMurray (16th), Brad Keselowski (19th) and Kevin Harvick (20th) rounded out the top 20. Of the remaining Chasers, Tony Stewart was 24th quick, followed by Kyle Busch (28th) and Chris Buescher (31st). Buescher currently sits in the Chase cellar 30 points behind 12th-place Larson. Jeff Gordon was 17th (162.316mph) in his return to Dover. Gordon, who is subbing for Dale Earnhardt Jr. this week, last ran at Richmond. Several drivers asked their spotters for additional time coming off of pit road before making qualifying runs. Although the track had been dried prior to practice, pit road remained damp. McMurray: "The Chase hasn’t had the drama that it normally does"